Author: Chabon, Michael Set In . . . The Pulitzer Prize–winning author’s “astonishing” debut novel, about a son’s struggle to find his own identity and integrity (The New York Times). Michael Chabon, author of The Amazing Adventures of Kavalier & Clay, Moonglow, and The Yiddish Policeman’s Union, is one of the most acclaimed talents in contemporary fiction. 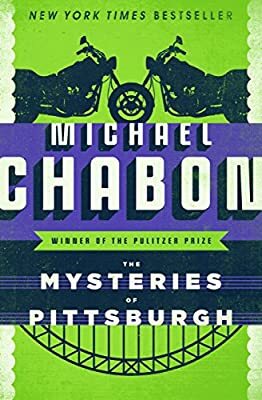 The Mysteries of Pittsburgh, published when Chabon was just twenty-five, is the beautifully crafted debut that propelled him into the literary stratosphere. Art Bechstein may be too young to know what he wants to do with his life, but he knows what he doesn’t want: the life of his father, a man who laundered money for the mob. He spends the summer after graduation finding his own way, experimenting with a group of brilliant and seductive new friends: erudite Arthur Lecomte, who opens up new horizons for Art; mercurial Phlox, who confounds him at every turn; and Cleveland, a poetry-reciting biker who pulls him inevitably back into his father’s mobbed-up world. A New York Times bestseller, The Mysteries of Pittsburgh was called “astonishing” by Alice McDermott, and heralded the arrival of one of our era’s great voices.